Who am I kidding? I have not suffered for Christ and between you and me, just the idea of it scares the bajeebies out of me. 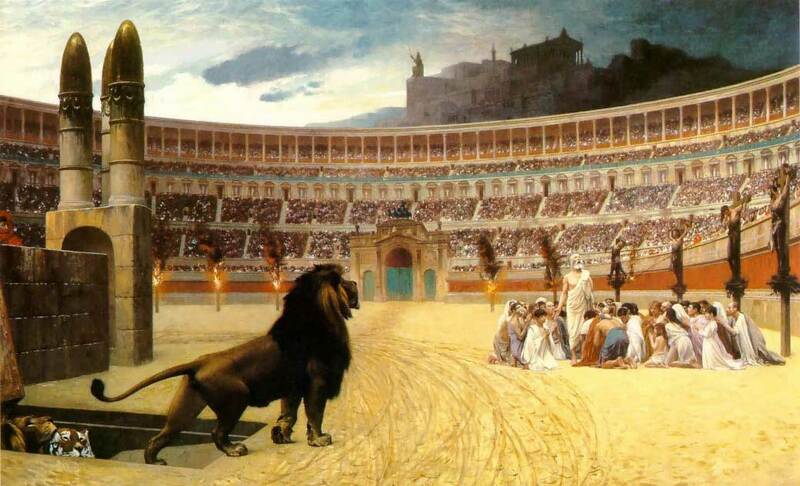 All that comes to mind are the lions , the Christians, and the Roman Colosseum. Not a pretty thought. Or people thrown in prison or crucified. Or Mother Teresa. For it has been granted to you on behalf of Christ not only to believe in him, but also to suffer for him, . . . The word “suffer” always conjures up extremes. And not only that, but this verse indicates that it’s a privilege to suffer. The implied implication here is that “not suffering” probably means we’re not doing it right. One author even said it’s because we’re keeping silent and not preaching/telling the gospel message. We’re not suffering because we’re not doing our jobs. All right, I need to settle down here. I am not suffering, true. And so this message is intended for those who are suffering. Somewhere, in their pain, there is a truth that is intended for comfort: Christ suffered and followers throughout the ages and even today, have suffered. Hold fast to the truth of that because there’s a promise that no one else can receive. That’s hard to believe but we must remember the complete paradoxical nature of our faith. What we presume is the logical way, is not the best way. I don’t believe I am to seek suffering as a way to test my faith or glob onto some kind of a blessing. But when that day comes, then I will remember that hope rests in the One and my pain can be a gift. Paul Brand and Philip Yancey wrote a book called Pain, the Gift that Nobody Wants. This is a fascinating book and opens up this idea of pain and what it means both to the body and to the soul. I recommend it. And I thank God for the words of grace that may be preparing me for that day of pain, that day of suffering. For life is unpredictable and we can never know what tomorrow holds. But I am not to fear the unknown and I am not to fear pain. Forgive me Lord God for giving fear such power in my life.